It’s time for the Festive Friday Challenge, where every challenge is a party! For FF0018, we are celebrating Sweetest Day (October 20th) and/or Stripes. I opted to create this quick and easy romantic card to hand to my “sweetie”. Whatever way you decide to create is fine with us. We would love to have you play along. Oh my gosh! It doesn’t get any easier than this card! A delicate floral overlay from the Delightfully Detailed Laser Cut Specialty Paper collection was adhered to Real Red cardstock. and accented with two hearts. I had planned on using the hearts from the Support Ribbon Framelits collection, which for some reason I could not find. Luckily I still have the retired Sweet & Sassy Framelits, so I used them. A few rhinestones were added to accent the open flowers. Would you like to create your own easy romantic card? If you enjoyed today’s card, and would like to create your own easy romantic card, the supply list is located below. Clicking on a product takes you right to my store. Be sure to use this month’s Host Code. Online orders over $50 (before tax and shipping) will receive a little gift from me IF you use the Host Code. If your order is $150 or more, please do not use the Host Code. You will automatically receive the gift from me, as well as your own Host Rewards. 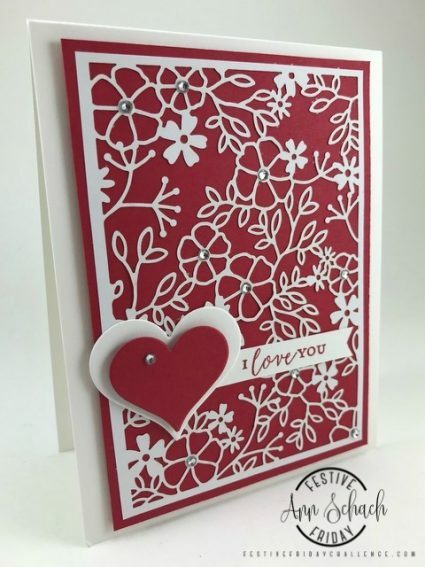 Delightfully Detailed Laser Cut Specialty Paper, Detailed with Love stamp set, Stampin' Up!. Bookmark. This is so beautiful, yet I can see it would be easier to make than it looks. Love the cover plates. Hugs. Your card is very elegant! I’m certain that your husband will be very happy to receive your beautiful card. Enjoy the weekend Ann.